If you frequent mine or any blog on the internet you have likely become familiar with a little thing called RSS feeds. RSS is of course an acronym, which depending on who you talk to has a few variations. 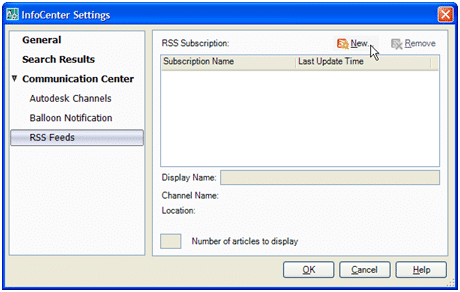 The generally accepted definition for RSS is Real Simple Syndication. Many people who frequent a specific blog will add it to a feed reader. The power behind RSS feeds are their flexibility. They can be added to an array of feed reading devices such as My Yahoo, Google Reader, even the latest versions of Outlook and Internet Explorer. Although each of these programs has their differences, the core similarity is the ability to group together multiple RSS feeds, effectively notifying an individual when a website of interest is updated. But even still what does all of this have to do with AutoCAD? AutoCAD 2008 adds what it calls the “InfoCenter” to the menu bar. As its name implies, the InfoCenter provides quick access to many of AutoCAD’s information sources; namely the AutoCAD help file. 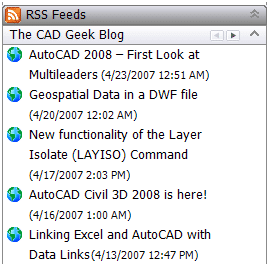 In addition to gaining quick access to the AutoCAD help file, the AutoCAD InfoCenter can now provide access to RSS feeds. Translation, AutoCAD now has the ability to serve as a feed reader! Some of the long-time CAD users out there (myself included) likely remember the AutoCAD Today screen. For the benefit of those who may not be familiar with the interface; the AutoCAD Today screen appeared at startup, containing some basic information about CAD including a message from the CAD Manager to all CAD users. Quite honestly it was one of those features where you either liked it or loved it. Obviously its omission from current releases of the software is testament to the fact that it did not gain a widespread adoption among CAD users. Rule #1 of management is to effectively communicate with those you manage. Rule #1 of marketing is to target your audience by targeting the places they go. So what better way to communicate with your users than through the very interface they spend 80% of their time? The ability to use AutoCAD as a feed reader allows a CAD Manager to communicate with users through the use of a RSS feed. Make a post to remind users of an upcoming CAD meeting. Start a tip-a-day/week feature targeting what your users are doing. The possibilities are endless. 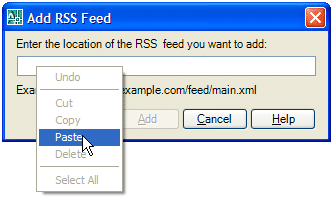 Setting up an RSS feed is not as difficult as it may seem. Any blogging platform worth using today has the ability to generate a RSS feed. I personally use WordPress to host this blog. Other popular platforms include TypePad, and Blogger. Since the setup of each of these range in complexity, I am going to default to the setup information contained on each of the sites I mentioned. 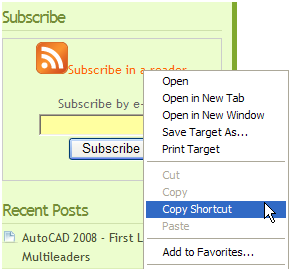 Adding a RSS feed to AutoCAD is rather easy, and can be done with minimal fuss. 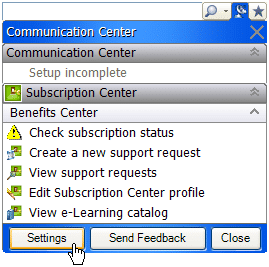 Click the button on the InfoCenter which looks like a satellite, and finally the Settings button. Go to your favorite website which has the standard RSS button, right-click and select Copy Shortcut. Select RSS Feeds on the left, and finally the New button in the upper right corner. Right-Click in the resulting dialogue box and select Paste. Click Add to save the link. Once you click Add the RSS Feed Confirmation dialogue will come up. Your only option is to click Ok, but you can use this to make sure it appears as you expect it. Finally Ok out of the dialogue. Now with my Blog added, clicking on the satellite icon on the InfoCenter will result in a list including links to my recent Blog posts. In addition to being listed in the InfoCenter AutoCAD will also provide a Baloon notification whenever a new post is made to my Blog. Admittedly relying on RSS feeds should not be seen as a primary means of communication with your users. I do feel that setting up an internal RSS feed can be a supplemental communication method with users. A side effect of hosting an internal blog, which gets syndicated to CAD, is that you also end up developing an in-house knowledge base. Regardless if you are a user who likes to keep up with various Blogs, or a CAD Manager looking for new ways to communicate with users, the new RSS feeds in AutoCAD have something to offer you. @G – I agree with all you said, not sure if you are saying that intersection design is “bells and whistles” or refering to something else?? Lets just say that 12D Design Software (see 12d.com) does all this and more and even power users find it hard to crash, (unlike Civil3D)! Head to my website, send me an email on the contact form if you’d like more info. Autodesk should ignore bell and whistle inovation untill it corrects existing problems. We are LDT users. A serious flaw exists in both 2007 and 2008. In view/edit sections, after setting templates and applying transition lines, ditch profiles, etc, processing sections will, unknown to the user, re-apply that last assigned template from itâ€™s start to the end of the alignment. It may take days to correct this damage. A nifty infocenter interface to a shoddy help file is an insult. Our next upgrade may be Bentley. Thanks for your thoughts, I still think that AutoCAD 2004 is adequate for 90% of all the work we do that’s just drafting. Unfortunately, we’re mostly civil3D designing, now that’s a buggy bit of software, and any upgrade (you would assume) would be welcome. 2007 was pretty much a full priced public beta, AutoCad needs to rebuild some trust in the industry instead of pumping out full priced upgrades, offer radical improvements on day to day design items. When you pay that much for road design software, you’d assume that it would actually help you design a road intersection, (not just the roads). Urbanmike â€“ As you noted the RSS feeds are more along the lines of simply another nifty addition to AutoCAD. Does it increase productivity? Not really. Are the RSS feeds worth upgrading to 08? Definitely not by their self. Personally I am more intrigued by things like Annotative Scaling and Multileaders. Those two tools alone make AutoCAD 2008 at least worth considering. If you just upgraded to AutoCAD 2007 it may be a hard sell (depending on company size and the many other variables). If you are on AutoCAD 2006 (as my firm is), then AutoCAD 2008 is nearly a no brainer. Seems easy enough, not sure it’s the greatest use of RSS for overall productivity, but would be useful for subscribing to CAD clinics and tutorials. Is it worth the upgrade to 2008? I’ve got an office full of CAD users who are doing fine on 2006/7, why upgrade?